Cheat Sheet: IoT Coding Skills #Infographic - Your journey to a new career. Discover the most important coding languages you can learn to jump start or further your programming career all in one infographic. If you want to take advantage of critical shortages in the tech industry, check out CloudTweaks Ultimate Cheat Sheet to Learning Code for the best advice on how today’s codes are being utilised and which you should learn first. Don’t waste your time learning yesterday’s outdated code. Learn the codes that are being used to develop today’s most popular apps, websites and games. Do you know what code is powering your favorite? This simple infographic gives you the basics about what the top codes were created for, how they are used, and the most notable applications that use them. You’ll also find out how much learning the codes could earn you, the top employers for each language, and the top cities that are hiring qualified coders. 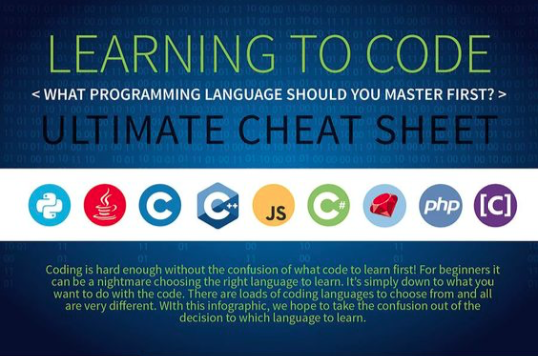 Get a quick summary of how challenging the codes really are; how popular each language is; the pros and cons of each code and fascinating facts about them you can use to break the ice with co-workers at your new job. If you love technology and want to build the next best thing, get started with this Cheat Sheet to Learning Code.